Injection moulding (injection molding in the USA) is a manufacturing process for producing parts by injecting material into a mould. Injection moulding can be performed with a host of materials, including metals, (for which the process is called diecasting), glasses, elastomers, confections, and most commonly thermoplastic and thermosetting polymers. Material for the part is fed into a heated barrel, mixed, and forced into a mould cavity, where it cools and hardens to the configuration of the cavity. After a product is designed, usually by an industrial designer or an engineer, moulds are made by a mouldmaker (or toolmaker) from metal, usually either steel or aluminum, and precision-machined to form the features of the desired part. Injection moulding is widely used for manufacturing a variety of parts, from the smallest components to entire body panels of cars. Advances in 3D printing technology, using photopolymers which do not melt during the injection moulding of some lower temperature thermoplastics, can be used for some simple injection moulds. Injection moulding is used to create many things such as wire spools, packaging, bottle caps, automotive parts and components, Gameboys, pocket combs, some musical instruments (and parts of them), one-piece chairs and small tables, storage containers, mechanical parts (including gears), and most other plastic products available today. Injection moulding is the most common modern method of manufacturing plastic parts; it is ideal for producing high volumes of the same object. Injection moulding uses a ram or screw-type plunger to force molten plastic material into a mould cavity; this solidifies into a shape that has conformed to the contour of the mould. It is most commonly used to process both thermoplastic and thermosetting polymers, with the volume used of the former being considerably higher. Thermoplastics are prevalent due to characteristics which make them highly suitable for injection moulding, such as the ease with which they may be recycled, their versatility allowing them to be used in a wide variety of applications, and their ability to soften and flow upon heating. Thermoplastics also have an element of safety over thermosets; if a thermosetting polymer is not ejected from the injection barrel in a timely manner, chemical crosslinking may occur causing the screw and check valves to seize and potentially damaging the injection moulding machine. Injection moulding consists of high pressure injection of the raw material into a mould which shapes the polymer into the desired shape. Moulds can be of a single cavity or multiple cavities. In multiple cavity moulds, each cavity can be identical and form the same parts or can be unique and form multiple different geometries during a single cycle. Moulds are generally made from tool steels, but stainless steels and aluminum moulds are suitable for certain applications. Aluminum moulds typically are ill-suited for high volume production or parts with narrow dimensional tolerances, as they have inferior mechanical properties and are more prone to wear, damage, and deformation during the injection and clamping cycles; however, aluminum moulds are cost-effective in low-volume applications, as mould fabrication costs and time are considerably reduced. Many steel moulds are designed to process well over a million parts during their lifetime and can cost hundreds of thousands of dollars to fabricate. When thermoplastics are moulded, typically pelletized raw material is fed through a hopper into a heated barrel with a reciprocating screw. Upon entrance to the barrel the temperature increases and the Van der Waals forces that resist relative flow of individual chains are weakened as a result of increased space between molecules at higher thermal energy states. This process reduces its viscosity, which enables the polymer to flow with the driving force of the injection unit. The screw delivers the raw material forward, mixes and homogenizes the thermal and viscous distributions of the polymer, and reduces the required heating time by mechanically shearing the material and adding a significant amount of frictional heating to the polymer. The material feeds forward through a check valve and collects at the front of the screw into a volume known as a shot. A shot is the volume of material that is used to fill the mould cavity, compensate for shrinkage, and provide a cushion (approximately 10% of the total shot volume, which remains in the barrel and prevents the screw from bottoming out) to transfer pressure from the screw to the mould cavity. When enough material has gathered, the material is forced at high pressure and velocity into the part forming cavity. To prevent spikes in pressure, the process normally uses a transfer position corresponding to a 95–98% full cavity where the screw shifts from a constant velocity to a constant pressure control. Often injection times are well under 1 second. Once the screw reaches the transfer position the packing pressure is applied, which completes mould filling and compensates for thermal shrinkage, which is quite high for thermoplastics relative to many other materials. The packing pressure is applied until the gate (cavity entrance) solidifies. Due to its small size, the gate is normally the first place to solidify through its entire thickness. Once the gate solidifies, no more material can enter the cavity; accordingly, the screw reciprocates and acquires material for the next cycle while the material within the mould cools so that it can be ejected and be dimensionally stable. This cooling duration is dramatically reduced by the use of cooling lines circulating water or oil from an external temperature controller. Once the required temperature has been achieved, the mould opens and an array of pins, sleeves, strippers, etc. are driven forward to demould the article. Then, the mould closes and the process is repeated. For thermosets, typically two different chemical components are injected into the barrel. These components immediately begin irreversible chemical reactions which eventually crosslinks the material into a single connected network of molecules. As the chemical reaction occurs, the two fluid components permanently transform into a viscoelastic solid. Solidification in the injection barrel and screw can be problematic and have financial repercussions; therefore, minimizing the thermoset curing within the barrel is vital. This typically means that the residence time and temperature of the chemical precursors are minimized in the injection unit. The residence time can be reduced by minimizing the barrel’s volume capacity and by maximizing the cycle times. These factors have led to the use of a thermally isolated, cold injection unit that injects the reacting chemicals into a thermally isolated hot mould, which increases the rate of chemical reactions and results in shorter time required to achieve a solidified thermoset component. After the part has solidified, valves close to isolate the injection system and chemical precursors, and the mould opens to eject the moulded parts. Then, the mould closes and the process repeats. Pre-moulded or machined components can be inserted into the cavity while the mould is open, allowing the material injected in the next cycle to form and solidify around them. This process is known as Insert moulding and allows single parts to contain multiple materials. This process is often used to create plastic parts with protruding metal screws, allowing them to be fastened and unfastened repeatedly. This technique can also be used for In-mould labelling and film lids may also be attached to moulded plastic containers. A parting line, sprue, gate marks, and ejector pin marks are usually present on the final part. None of these features are typically desired, but are unavoidable due to the nature of the process. Gate marks occur at the gate which joins the melt-delivery channels (sprue and runner) to the part forming cavity. Parting line and ejector pin marks result from minute misalignments, wear, gaseous vents, clearances for adjacent parts in relative motion, and/or dimensional differences of the mating surfaces contacting the injected polymer. Dimensional differences can be attributed to non-uniform, pressure-induced deformation during injection, machining tolerances, and non-uniform thermal expansion and contraction of mould components, which experience rapid cycling during the injection, packing, cooling, and ejection phases of the process. Mould components are often designed with materials of various coefficients of thermal expansion. These factors cannot be simultaneously accounted for without astronomical increases in the cost of design, fabrication, processing, and quality monitoring. The skillful mould and part designer will position these aesthetic detriments in hidden areas if feasible. American inventor John Wesley Hyatt together with his brother Isaiah, Hyatt patented the first injection moulding machine in 1872. This machine was relatively simple compared to machines in use today: it worked like a large hypodermic needle, using a plunger to inject plastic through a heated cylinder into a mould. The industry progressed slowly over the years, producing products such as collar stays, buttons, and hair combs. The German chemists Arthur Eichengrün and Theodore Becker invented the first soluble forms of cellulose acetate in 1903, which was much less flammable than cellulose nitrate. It was eventually made available in a powder form from which it was readily injection moulded. Arthur Eichengrün developed the first injection moulding press in 1919. In 1939, Arthur Eichengrün patented the injection molding of plasticized cellulose acetate. The industry expanded rapidly in the 1940s because World War II created a huge demand for inexpensive, mass-produced products. In 1946, American inventor James Watson Hendry built the first screw injection machine, which allowed much more precise control over the speed of injection and the quality of articles produced. This machine also allowed material to be mixed before injection, so that colored or recycled plastic could be added to virgin material and mixed thoroughly before being injected. Today screw injection machines account for the vast majority of all injection machines. In the 1970s, Hendry went on to develop the first gas-assisted injection moulding process, which permitted the production of complex, hollow articles that cooled quickly. This greatly improved design flexibility as well as the strength and finish of manufactured parts while reducing production time, cost, weight and waste. The plastic injection moulding industry has evolved over the years from producing combs and buttons to producing a vast array of products for many industries including automotive, medical, aerospace, consumer products, toys, plumbing, packaging, and construction. Most polymers, sometimes referred to as resins, may be used, including all thermoplastics, some thermosets, and some elastomers. Since 1995, the total number of available materials for injection moulding has increased at a rate of 750 per year; there were approximately 18,000 materials available when that trend began. Available materials include alloys or blends of previously developed materials, so product designers can choose the material with the best set of properties from a vast selection. Major criteria for selection of a material are the strength and function required for the final part, as well as the cost, but also each material has different parameters for moulding that must be taken into account. Common polymers like epoxy and phenolic are examples of thermosetting plastics while nylon, polyethylene, and polystyrene are thermoplastic. Until comparatively recently, plastic springs were not possible, but advances in polymer properties make them now quite practical. Applications include buckles for anchoring and disconnecting outdoor-equipment webbing. Injection moulding machines consist of a material hopper, an injection ram or screw-type plunger, and a heating unit. Also known as presses, they hold the moulds in which the components are shaped. Presses are rated by tonnage, which expresses the amount of clamping force that the machine can exert. This force keeps the mould closed during the injection process. Tonnage can vary from less than 5 tons to over 9,000 tons, with the higher figures used in comparatively few manufacturing operations. The total clamp force needed is determined by the projected area of the part being moulded. This projected area is multiplied by a clamp force of from 1.8 to 7.2 tons for each square centimeter of the projected areas. As a rule of thumb, 4 or 5 tons/in2 can be used for most products. If the plastic material is very stiff, it will require more injection pressure to fill the mould, and thus more clamp tonnage to hold the mould closed. The required force can also be determined by the material used and the size of the part; larger parts require higher clamping force. Mould or die are the common terms used to describe the tool used to produce plastic parts in moulding. Since moulds have been expensive to manufacture, they were usually only used in mass production where thousands of parts were being produced. Typical moulds are constructed from hardened steel, pre-hardened steel, aluminum, and/or beryllium-copper alloy. The choice of material to build a mould from is primarily one of economics; in general, steel moulds cost more to construct, but their longer lifespan will offset the higher initial cost over a higher number of parts made before wearing out. Pre-hardened steel moulds are less wear-resistant and are used for lower volume requirements or larger components; their typical steel hardness is 38–45 on the Rockwell-C scale. Hardened steel moulds are heat treated after machining; these are by far superior in terms of wear resistance and lifespan. Typical hardness ranges between 50 and 60 Rockwell-C (HRC). Aluminum moulds can cost substantially less, and when designed and machined with modern computerized equipment can be economical for moulding tens or even hundreds of thousands of parts. Beryllium copper is used in areas of the mould that require fast heat removal or areas that see the most shear heat generated. The moulds can be manufactured either by CNC machining or by using electrical discharge machining processes. The mould consists of two primary components, the injection mould (A plate) and the ejector mould (B plate). These components are also referred to as moulder and mouldmaker. Plastic resin enters the mould through a sprue or gate in the injection mould; the sprue bushing is to seal tightly against the nozzle of the injection barrel of the moulding machine and to allow molten plastic to flow from the barrel into the mould, also known as the cavity. The sprue bushing directs the molten plastic to the cavity images through channels that are machined into the faces of the A and B plates. These channels allow plastic to run along them, so they are referred to asrunners. The molten plastic flows through the runner and enters one or more specialized gates and into the cavity geometry to form the desired part. The amount of resin required to fill the sprue, runner and cavities of a mould comprises a “shot”. Trapped air in the mould can escape through air vents that are ground into the parting line of the mould, or around ejector pins and slides that are slightly smaller than the holes retaining them. If the trapped air is not allowed to escape, it is compressed by the pressure of the incoming material and squeezed into the corners of the cavity, where it prevents filling and can also cause other defects. The air can even become so compressed that it ignites and burns the surrounding plastic material. Sides of the part that appear parallel with the direction of draw (the axis of the cored position (hole) or insert is parallel to the up and down movement of the mould as it opens and closes) are typically angled slightly, called draft, to ease release of the part from the mould. Insufficient draft can cause deformation or damage. The draft required for mould release is primarily dependent on the depth of the cavity: the deeper the cavity, the more draft necessary. Shrinkage must also be taken into account when determining the draft required. If the skin is too thin, then the moulded part will tend to shrink onto the cores that form while cooling and cling to those cores, or the part may warp, twist, blister or crack when the cavity is pulled away. A mould is usually designed so that the moulded part reliably remains on the ejector (B) side of the mould when it opens, and draws the runner and the sprue out of the (A) side along with the parts. The part then falls freely when ejected from the (B) side. Tunnel gates, also known as submarine or mould gates, are located below the parting line or mould surface. An opening is machined into the surface of the mould on the parting line. The moulded part is cut (by the mould) from the runner system on ejection from the mould. Ejector pins, also known as knockout pins, are circular pins placed in either half of the mould (usually the ejector half), which push the finished moulded product, or runner system out of a mould. The ejection of the article using pins, sleeves, strippers, etc. may cause undesirable impressions or distortion, so care must be taken when designing the mould. The standard method of cooling is passing a coolant (usually water) through a series of holes drilled through the mould plates and connected by hoses to form a continuous pathway. The coolant absorbs heat from the mould (which has absorbed heat from the hot plastic) and keeps the mould at a proper temperature to solidify the plastic at the most efficient rate. More complex parts are formed using more complex moulds. These may have sections called slides, that move into a cavity perpendicular to the draw direction, to form overhanging part features. When the mould is opened, the slides are pulled away from the plastic part by using stationary “angle pins” on the stationary mould half. These pins enter a slot in the slides and cause the slides to move backward when the moving half of the mould opens. The part is then ejected and the mould closes. The closing action of the mould causes the slides to move forward along the angle pins. Two-shot or multi-shot moulds are designed to “overmould” within a single moulding cycle and must be processed on specialized injection moulding machines with two or more injection units. This process is actually an injection moulding process performed twice and therefore has a much smaller margin of error. In the first step, the base color material is moulded into a basic shape, which contains spaces for the second shot. Then the second material, a different color, is injection-moulded into those spaces. Pushbuttons and keys, for instance, made by this process have markings that cannot wear off, and remain legible with heavy use. A mould can produce several copies of the same parts in a single “shot”. The number of “impressions” in the mould of that part is often incorrectly referred to as cavitation. A tool with one impression will often be called a single impression (cavity) mould. A mould with 2 or more cavities of the same parts will likely be referred to as multiple impression (cavity) mould. Some extremely high production volume moulds (like those for bottle caps) can have over 128 cavities. In some cases multiple cavity tooling will mould a series of different parts in the same tool. Some toolmakers call these moulds family moulds as all the parts are related. Examples include plastic model kits. As the number of cavities play a vital role in moulding costs, so does the complexity of the part’s design. Complexity can be incorporated into many factors such as surface finishing, tolerance requirements, internal or external threads, fine detailing or the number of undercuts that may be incorporated. The sequence of events during the injection mould of a plastic part is called the injection moulding cycle. The cycle begins when the mould closes, followed by the injection of the polymer into the mould cavity. Once the cavity is filled, a holding pressure is maintained to compensate for material shrinkage. In the next step, the screw turns, feeding the next shot to the front screw. This causes the screw to retract as the next shot is prepared. Once the part is sufficiently cool, the mould opens and the part is ejected. Traditionally, the injection portion of the molding process was done at one constant pressure to fill and pack the cavity. This method, however, allowed for a large variation in dimensions from cycle-to-cycle. More commonly used now is scientific or decoupled moulding, a method pioneered by RJG Inc. In this the injection of the plastic is “decoupled” into stages to allow better control of part dimensions and more cycle-to-cycle (commonly called shot-to-shot in the industry) consistency. First the cavity is filled to approximately 98% full using velocity (speed) control. Although the pressure should be sufficient to allow for the desired speed, pressure limitations during this stage are undesirable. Once the cavity is 98% full, the machine switches from velocity control to pressure control, where the cavity is “packed out” at a constant pressure, where sufficient velocity to reach desired pressures is required. This allows part dimensions to be controlled to within thousandths of an inch or better. 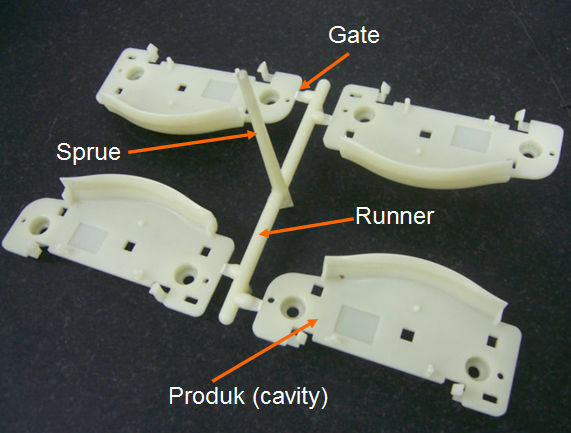 Like all industrial processes, injection moulding can produce flawed parts. In the field of injection moulding, troubleshooting is often performed by examining defective parts for specific defects and addressing these defects with the design of the mould or the characteristics of the process itself. Trials are often performed before full production runs in an effort to predict defects and determine the appropriate specifications to use in the injection process. Injection moulding is a complex technology with possible production problems. They can be caused either by defects in the moulds, or more often by the moulding process itself. Color streaks (US) Colour streaks (UK) Localized change of color/colour Masterbatch isn’t mixing properly, or the material has run out and it’s starting to come through as natural only. Previous colored material “dragging” in nozzle or check valve. Polymer degradation Polymer breakdown fromhydrolysis, oxidation etc. Excess water in the granules, excessive temperatures in barrel, excessive screw speeds causing high shear heat, material being allowed to sit in the barrel for too long, too much regrind being used. Splay marks Splash mark or silver streaks Usually appears as silver streaks along the flow pattern, however depending on the type and color of material it may represent as small bubbles caused by trapped moisture. Moisture in the material, usually when hygroscopic resins are dried improperly. Trapping of gas in “rib” areas due to excessive injection velocity in these areas. Material too hot, or is being sheared too much. Stringiness Stringing or long-gate String like remnant from previous shot transfer in new shot Nozzle temperature too high. Gate hasn’t frozen off, no decompression of the screw, no sprue break, poor placement of the heater bands inside the tool. Voids Empty space within part (air pocket is commonly used) Lack of holding pressure (holding pressure is used to pack out the part during the holding time). Filling too fast, not allowing the edges of the part to set up. Also mould may be out of registration (when the two halves don’t center properly and part walls are not the same thickness). The provided information is the common understanding, Correction: The Lack of pack (not holding) pressure (pack pressure is used to pack out even though is the part during the holding time). Filling too fast does not cause this condition, as a void is a sink that did not have a place to happen. In other words, as the part shrinks the resin separated from itself as there was not sufficient resin in the cavity. The void could happen at any area or the part is not limited by the thickness but by the resin flow and thermal conductivity, but it is more likely to happen at thicker areas like ribs or bosses. Additional root causes for voids are un-melt on the melt pool. Weld line Knit line / Meld line / Transfer line Discolored line where two flow fronts meet Mould or material temperatures set too low (the material is cold when they meet, so they don’t bond). Time for transition between injection and transfer (to packing and holding) is too early. Moulding tolerance is a specified allowance on the deviation in parameters such as dimensions, weights, shapes, or angles, etc. To maximize control in setting tolerances there is usually a minimum and maximum limit on thickness, based on the process used. Injection moulding typically is capable of tolerances equivalent to an IT Grade of about 9–14. The possible tolerance of a thermoplastic or a thermoset is ±0.200 to ±0.500 millimeters. In specialised applications tolerances as low as ±5 µm on both diameters and linear features are achieved in mass production. Surface finishes of 0.0500 to 0.1000 µm or better can be obtained. Rough or pebbled surfaces are also possible. The power required for this process of injection moulding depends on many things and varies between materials used. Manufacturing Processes Reference Guide states that the power requirements depend on “a material’s specific gravity, melting point, thermal conductivity, part size, and molding rate.” Below is a table from page 243 of the same reference as previously mentioned that best illustrates the characteristics relevant to the power required for the most commonly used materials.